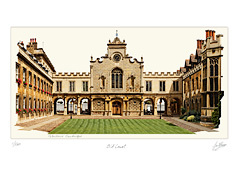 Peterhouse, which was founded in 1284 by Hugh de Balsham, the Bishop of Ely, is the oldest college in Cambridge. Beyond the chapel cloisters is the 15th century Old Court. The Hall is the only building to have survived from the 13th century - between 1866 and 1870, this was restored by the architect George Gilbert Scott. The north and west sides of Old Court were added in the 15th century. The Chapel was built on the east side of the court in 1628 when the Master of the time Matthew Wren (Christopher Wren’s uncle) demolished the college’s original hostels. It is a mix of Renaissance architecture within a traditional Gothic building.